Important: RG702 Do NOT compatible with AT&T, Verizon,Sprint,Boost,Virgin. RG702 is not a 4G phone, only Support 2G GSM Frequencies 850/900/1800/1900 MHz and 3G WCDMA Frequencies 900/1900/ 2100 MHz. So please make sure your SIM card support one of these Frequencies before you add it to cart. RG702 is compatible with most of the prepaid unlock GSM service provider, like T-Mobile, H20, ptel, Cingular and All 2G GSM Networks Worldwide..
IP-68 waterproof Certification. Submersible up to 1.5 Metres for 1 hour, Water Shock Dust Proof, Military Grade Waterproof smartphone, dust proof and shock proof; Military Standard Compliant: Mil-Std 810G Compliant. Shock Test : 1.5 Metres Drop Test..
CPU MT6582 (1.3GHZ Quad Core) Android v4.4. Dual SIM. 4.5" IPS HD Main Screen Capacitive Touch Panel,Resolution:854 x 480 Pixels. Supports Glove Operate on Capacitive TouchScreen. support USB OTG,can be connect to U disk, U driver to play movies.. Camera: 8.0MP (Rear) / 5.0MP (Front). Lithium-ion 3600 mAh battery Talk-Time: 13 hours (with 2G) . 4GB ROM + 1G RAM, External Memory: Up to 32 GB Micro SD. support Wi-Fi IEEE 802.11b/g/n/, GPS and 4.0 Bluetooth..
WHATS'S IN THE BOX? RG702 rugged Unlocked phone, Battery,USB Cable,USB Power Adapter,OTG Cable,Earphone,User manual. Please open the battery cover and remove the insulating paper on the battery PIN when you get it..
Unlocked phone RG702 Support 2G GSM Frequencies 850/900/1800/1900 MHz and 3G WCDMA Frequencies 900/1900/ 2100 MHz. Important: 1. Please make sure your GSM SIM card support one of these Frequencies before you add it to cart. 2. Please open the battery cover and remove the insulating paper on the battery PIN when you get it. Thanks Unlocked RG702 phone compatible with most of the prepaid unlock GSM service provider, like T-Mobile, H20, etc.Attention: 1. RG702 Do Not support AT&T and Wi-Fi Calling, But you can install Skype and Whatsapp to make a phone call after connect Wi-Fi. 2. RG702 is not a 4G phone, it only can support 2G GSM and 3G WCDMA networks.3. Do NOT COMPATIBLE WITH CDMA Sprint, Verizon, Boost or Virgin. 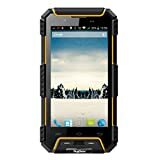 RugGear RG702 - RugGear Apex - IP68 Waterproof, dust proof and shock proof GPS Dual SIM Android waterproof smart Unlocked cell phone Yellow. 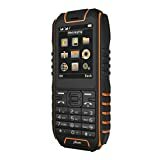 Tags: RugGear Phone, Ruggear RG702. Experience the unsurpassed durability of the new RugGear Apex - RG702. 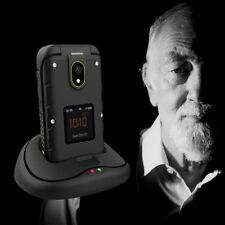 It is the ideal rugged solution for people who are constantly on the move due to extreme outdoor activities or who work in hazardous environments. Made from impermeable polycarbonate materials of the highest quality, RugGear Apex - RG702 withstands extreme temperatures, water, dust, and multiple shocks. The IP68 resistance adds up to the glove touch capabilities, making the RG702 the best option for both adrenaline seekers and industrial workers. Size:122 x 63 x 10.5 mm. Weight: 260g including battery. GPRS/HSPA /Wi-Fi IEEE 802.11b/g/n/ support GPS. 3.5 mm Stereo audio Jack. 4.0 (LE) Bluetooth. Micro USB for Charging and Data Transfer. Removable Li-lon 2000mAh battery,Stand-by Up to 180h ,Talk time Up to 16h. Dual SIM Card slot,32MB ROM,32MB RAM,microSD slot,up to 8GB(dedicated slot)..
IP68-water proof up to 1.5m for 30 mins with closed lids Drop-to-concrete resistance up to 1.5m. MP4/H.246 player MP3/eAAC+/WAV player Built-In FM Anterna Predictive text input. Note：In order to ensure the safety , there is a battery insulation sticker on the battery . you need to take off the Battery insulation sticker on the battery before use normally..
Big Battery and Dual SIM:The E&L S50 smartphone has 2700mAh high-capacity battery with power-saving to support long time standby,Standby Time: 246 hrs,Talk-Time: 19 hrs, it supports LTE 4G Speedy and more stable. It has dual SIM card, dual standby, one smartphone. 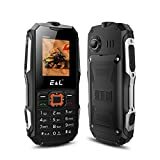 IP68 Waterproof Dustproof Drop proof：The E&L S50 Unlocked Cell Phone can keep water out to a depth of 5m for 60 minutes with closed lids IP68 Waterproof . smartphone exceeds military specifications, through rigorous tests of contortion, high and low temperature, and physical key reliability. You don't worry any scratching and accidental drops. Large Memory and High Pixels:Equipped with the Android OS v6.0 can be updated to Android OS v7.0, 3GB RAM+32GB ROM, the operating page has been streamlined to increase the cell phone's overall memory storage capacity, operating memory creating a smooth and fluid user experience.13MP+8MP camera, you will enjoy every exciting moment of playing games and watching videos in stunning visuals and perfect clarity.It is a good quality low price outdoor phone. Safe and Multifunction:A new technology-Fingerprint Recognition, applied to S50, let you unlock your phone more quickly and you can also pay via fingerprint. Fast and convenient way in modern daily life.IP68 Waterproof/Shockproof/Dustproof; WiFi, Bluetooth,FM Radio GPS features for outdoor sports. 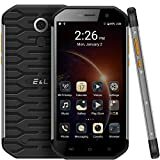 Unlocked 4G LTE Network：The E&L S50 unlocked cell phone support network AT&T / T-Mobile-2GGSM(850MHz/900MHz/1800MHz/1900MHz)/3G WCDMA(850/900/1900/2100)/ 4G LTE(B1/B2/B3/B4/B5/B7/B8/B17/B20), but not compatible with CDMA like Sprint and Verizon, if you have any question welcome contact us. AT&T And T-Mobile Network:2G GSM(850MHz/900MHz/1800MHz/1900MHz),3G WCDMA(850/900/1900/2100)..
4.0 Inch Display ,Corning Gorilla Glass Superior Damage Resistance Optical Clarity and Touch Sensitivity..
Android OS v6.0 To be updated to Android OS v7.0, Storage:8GB ROM+1GB RAM ,Camera: 5.0MP(Rear camera)..
Dual SIM card slot ( Micro-SIM Cards, Dual standby),Battery:Non-removable Li-lon 2800mAh battery..
IP68 Rated waterproof can survive up to 1.5 meter underwater for 30 mins,protection against dust, dirt, and sand.Military Standard 810G Certified Shockproof Dustproof. THE RAM 6 IS AN INCREDIBLY STRONG AND RUGGED PHONE PERFECT FOR THE OUTDOORS OR THOSE WITH DEMANDING JOBS. IT?S DESIGNED TO WITHSTAND EXTREME ELEMENTS AND ENORMOUS PRESSURE. WITH A CERTIFIED IP68 RATING, THIS PHONE IS DUST, SHOCK AND WATER RESISTANT ? ABLE TO BE SUBMERGED IN UP TO 2 FEET OF WATER FOR 30 MINUTES.ITS 2.4-INCH DISPLAY ALLOWS FOR BRIGHT AND CLEAR IMAGES TO EASILY NAVIGATE THE PHONE?S MENU. AND WHEN YOU?RE READY TO CAPTURE YOUR FAVORITE MOMENTS, YOU?LL HAVE A 1.3 MPX FRONT-FACING CAMERA SAVED ON A DEDICATED KEY FOR EASY ACCESS TO TAKE PHOTOS AND VIDEOS INSTANTLY.TAKE ADVANTAGE OF DUAL-SIM CAPABILITIES, WHICH IS ESPECIALLY HANDY FOR TRAVELERS SINCE IT?S LIKE HAVING TWO PHONES IN ONE. THE RAM 6 ALSO COMES STANDARD WITH 64 MB OF MEMORY, AND A SLOT FOR A MICRO-SD CARD, FOR UP TO AN ADDITIONAL 32 GB OF STORAGE, SO YOU?LL HAVE PLENTY OF SPACE TO STORE YOUR FAVORITE MEDIA. 【Support Carriers】AT&T / T-Mobile【2G GSM(850MHz/900MHz/1800MHz/1900MHz)/ 3G WCDMA(850/900/1900/2100)/ 4G LTE(B1/B2/B3/B4/B5/B7/B8/B17/B20)】. 【SIM Card】Dual Card Slots (Nano-SIM，dual stand-by) / Memory: ROM 64GB+RAM 3GB. 【Battery】Non-removable Li-lon 3000mAh battery【Standby-Time: 246 hrs; Talk-Time: 19 hrs】. 【System】Android 7.0 【Display】5.5 inches/1920x1080pixels 【WiFi,Bluetooth,FM Radio】. 【Feature】Fingerprint Sensor; IP68 Waterproof/Shockproof/Dustproof 【Camera】Front Camera: 13MP; Rear Camera: 8MP. 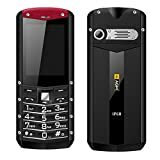 3G GSM Quad band Unlocked; 2.4" impact resistant display; 5 MP Rear Camera; 2 MP selfie Camera - FM Radio; MP3/MP4 Player; Bluetooth; loud speaker. IP68 Certified; Military Grade; water proof; shock proof; dust proof; Tough; durable; flashlight;. rugged phone; water proof; shock proof; dust proof; ip68; military grade; tough; durable; cheap; unlocked phones; cellular; gsm; dual sim; plum ram; no contract; prepaid; go phones; powerful battery; att; tmobile; metropcs; straight talk; cricket; h2o; pure talk; simple mobile; lyca; cricket; net10; h2o; tracfone; Walmart family; consumer cellular; ting; powerful battery. WHATS'S IN THE BOX? Phone, wall adapter, charging cable, headphones, manual, battery, 1 YEAR US WARRANTY UNLIMITED LIFETIME Support. THE RAM 7- 3G IS AN INCREDIBLY STRONG AND RUGGED PHONE PERFECT FOR THE OUTDOORS OR THOSE WITH DEMANDING JOBS. IT’S DESIGNED TO WITHSTAND EXTREME ELEMENTS AND ENORMOUS PRESSURE. WITH A CERTIFIED IP68 RATING, THIS PHONE IS DUST, SHOCK AND WATER RESISTANT – ABLE TO BE SUBMERGED IN UP TO 2 FEET OF WATER FOR 30 MINUTES. 2.4-INCH DISPLAY ALLOWS FOR BRIGHT AND CLEAR IMAGES TO EASILY NAVIGATE THE PHONE’S MENU. AND WHEN YOU’RE READY TO CAPTURE YOUR FAVORITE MOMENTS, YOU’LL HAVE A 5 MPX MAIN CAMERA SAVED ON A DEDICATED KEY FOR EASY ACCESS OR 2 MP CAMERA TO TAKE PHOTOS AND VIDEOS INSTANTLY. TAKE ADVANTAGE OF DUAL-SIM CAPABILITIES, WHICH IS ESPECIALLY HANDY FOR TRAVELERS SINCE IT’S LIKE HAVING TWO PHONES IN ONE. THE RAM 7 ALSO COMES STANDARD WITH 128H MB OF MEMORY, AND A SLOT FOR A MICRO-SD CARD, FOR UP TO AN ADDITIONAL 32 GB OF STORAGE, SO YOU’LL HAVE PLENTY OF SPACE TO STORE YOUR FAVORITE MEDIA. 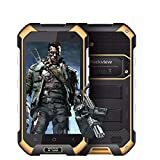 ✔【IP68 Rugged Phone】Unlocked Cell Phones Blackview BV6000S uses military material and special designed for outdoor activity, the phone supports IP68 waterproof, shockproof& dustproof &scratch resistance. IP68 makes BV6000S survivable in harsh outdoor environment. The BV6000S equipped with 4.7 HD touch screen and CNC metal frame. Corning gorilla glass 3 makes the device slightly more resilient in the event of a fall too, through rigorous tests of contortion, high and low temperature. 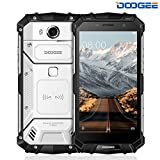 ✔【Waterproof Dual Camera】Rugged phone with dual cameras, 85°wide angle 2.0MP ov2680 front camera, 8.0MP IMX219 top level rear camera with the big aperture value of/2.0. IP68 break thought limitation to take photos whenever and wherever you like in the rain or underwater..
✔【Dual -Satellite Positioning System】Blackview BV6000S GPS Plus GLONASS dual satellite positioning, the double security system ensure your safety while you discovering the world the world outdoors. Also support Glonass, HOT SPOT, SOS, NFC..
✔【4500Mah Long Lasting BATTERY】Blackview BV6000S equiped with long lasting battery-Intelligent power management system helps the battery of BV6000 last long time. 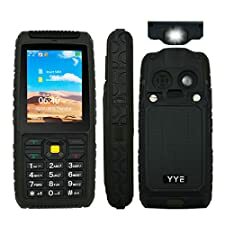 Also BV6000 rugged phone support 5V/2A FAST CHARGE..
✔【Unlocked 4G LTE& Dual Sim】Unlocked 4G, FDD LTE 800 / 900 / 1800 / 2100 / 2600, 3G WCDMA 850/900/1900 / 2100 , which works with AT& T MOBILE, T Mobile. It DOES NOT work with Verizon& Sprint. If you use any other carrier, pls kindly checking if your sim card support this phone or not by clicking: http://maps.mobileworldlive.com/ or clink ask a question, we will reply you within 12hours. 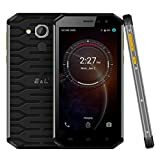 12 month Quality WARRANTY..
Specification Model: Unlocked cell phone/ Blackview BV6000S Rugged Phone Rugged: YES CPU: MT6737 Quad Core OS: Android 7.0 Screen: 4.7 HD Memory: 2GB RAM + 16GB ROM. Storage Extend: 32GB Resolution: 1280x720 pixels HD Cameras: Front Camera: 2.0MP front camera +8MP rear camera Battery: 4500mAh Battery built in Feature WIFI, Bluetooth 4.0,GPS,Gravity sensor, NFC,Gmail, Audio Player, Google Play Store, Google Maps, Google Navigation, Flashlight, Email, Clock, E-book, Calendar, Calculator, World Clock, Browser, etc... Network 2G: GSM 850 / 900 / 1800 / 1900 3G: WCDMA 850 / 900 / 1900 / 2100 4G: LTE 800 / 900 / 1800 / 2100 / 2600 Multi-media Video :MP4,3Gp,MOV,MKV,AVI,FLV,MPEG Audio FLAC,APE,AC,MKA,OGG,MIDI,M4A,AMR Image: JPEG,PNG,GIF,BMP Language Indonesian, Malay, Catalan, Czech, Danish, German, Estonian, English, Spanish, Filipino, French, Croatian, Italian, Latvian, Lithuanian, Hungarian, Dutch, Norwegian, Polish, Portuguese, Romanian, Slovak, Finnish, Swedish, Vietnamese, Greek, Turkish, Bulgarian, Russian, Serb, Ukrainian, Armenian, Hebrew, Urdu, Arabic, Persian, Hindi, Bengali, Thai, Korean, Burmese, Japanese, Simplified Chinese Package 1 x BV6000S phone 1 x USB Cable 1 x User Manual 1 x Charger 1 x OTG Cable1 x Tool Customer service Email: [email protected] Please dont be hesitate to write to us if you have any questions then we will repy you within 12hours.Thank you. 2.4" Impact Resistant Display. 2 MPX Camera - FM Radio, MP3/MP4 Player, Bluetooth, Loud Speaker..
IP 68 Certified, Water, Shock & Dust proof, Flashlight. Unlocked GSM Quad Band World Phone. 24 Hours Talk Time/ 900 Hours Standby/ 2700 mAh Battery- SD Card Slot Up To 32 GB. Tmobile, Metro Pcs, Cellular Abroad, Go Smart Mobile, Jaguar Mobile, Kids Connect, Liberty Wireless, Lyca Mobile, Mint Sim, Mobal, Simple Mobile, Speed Talk Mobile, Ultra Mobile, Univision Mobile, UVA Mobile, Value Mobile, Walmart family Mobile, Zip sim. Will not work with AT&T. Ram 4 from Plum Mobile is a Rugged unlocked phone with dual Sim capabilities. It has been IP68 Certified to be water / shock / dust proof. It compatible with all GSM networks world wide. IP68 waterproof,dustproof,dropproof ----From 1.5m to 1.8m drop, waterproof in 1.5 meter deep over 30 miutes, 99% dustproof..
Quality phone with the data proof ---- 100.000 times keystrokes test, 20.000 times twisting test. 24 hours -20 ~ 50 degrees operating temperature test. 5000 times earphone plug, 3000 times USB plug test..
Clearly visible typeface reading from 2 meters, big enough font for anyone easy to read..
Big Battery Long Lifetime ---- Real 1970Mah battery capacity, combined power-saving and easy to use system, maintain 300 hours standby, 600 minutes continuously talking.. NOTE: There is no physical volume buttons,you change volume in setting. 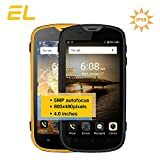 【IP68 Certified Waterproof Dustproof Shockproof】- With a military-grade body and a durable metal frame, reinforced with durable Corning Gorilla Glass 5, this 5.2 inch rugged smartphone withstand even the harshest environments - whether that's the construction site or the beach, Just enjoy your adventure; Supporting NFC,Back fingerprint unlock,Gyroscope..
【MT6750T Octa Core Processor】- Whether you're playing games, watching videos or even multitasking, DOOGEE S60 Lite can ensure you an amazingly smooth experience with its powerful MT6750T octa core processor and 4GB RAM plus 32GB ROM. Up to 128GB extended memory allows storing even more of your precious memories and entertaining documents..
【4G Network, High-precision GPS】- 4G network coverage allow you to stay in touch with your friends and the rest of the world in real time. 4G bands: FDD: B1/3/7/8/20; 3G bands/WCDMA: B1/8; 2G bands/GSM: B2/3/5/8; Please check out the frequencies before your purchase; The doubled navigating sensor, GPS and Glonass high-precision positioning, as well as its gyroscope, compass and other sensors make S60 Lite a must for outdoor adventurers..
【8MP+16MP High Resolution Camera】- Sony IMX 230 camera with 0.1s PDAF and a powerful dual-color flashlight helps you take great-looking photos that are accurately toned and clearly composed, even in dim light and underwater. Additionally, 9 shooting modes to enhance the creativity and fun of shooting photos, 88°wide angle technology in 8MP front camera allows selfiles with more friends..
【5580mAh Battery, 12V/2A Quick Charge】- 5580mAh large-capacity battery with 12V/2A quick charge promises long time use and super fast charge to 56% within 30 minutes, 60% faster than average. And wireless charge function enables more efficient charging and saves the tangled mass of usb cables..